Some people aren’t worried about being prepared for emergencies. Either because it never occurs to them or they think it’s silly attempting to prepare for every little disaster. 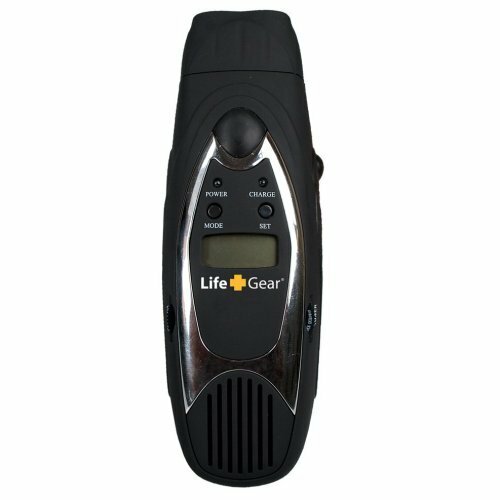 However, for those that are making an attempt to get something to make themselves feel a little more secure in the world, there is this Life Gear Personal Safety Device. It’s not as cool as some of the self defense gadgets, but it is much more practical since it has devices to help you with more issues than just being attacked. It can be powered by 3 alkaline batteries or a DC inlet with an optional wall adapter. When the alkaline batteries run out of juice, it has a hand crank to get it up and running again. All that cranking keeps the flashlight, emergency radio, emergency cellphone charger, a flasher, directional compass, and a 130 decibel siren. All of those devices could come in extremely handy should you find yourself stranded somewhere. The best part about it is that it’s very affordable. One of these will cost you $18.99 through Amazon.